This wonderful pendant is made of 14K yellow gold. It has a golden colored heart charm coupled with it. This heart charm can be engraved to give it a more stylish look. This dynamic feature makes it a flexible choice whenever a pendant is needed. The measurement of the dimension of this pendant gives the result as 21mm x 15mm. The unique design makes it a prized possession and owner's pride. The heart shape will make anyone skip their heart beat for moment. You can engrave up to 5 characters per side with a short engraving on front and/or back, such as initial or a date, to fit. You can also request monogram engraving in three styles. 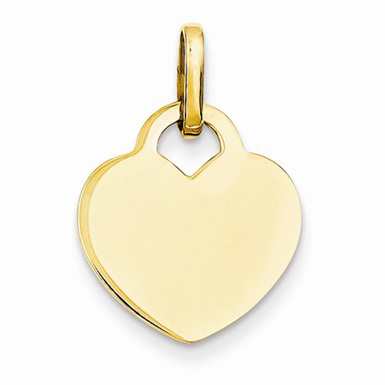 We guarantee our 14K Yellow Gold Engravable Heart Charm to be high quality, authentic jewelry, as described above.